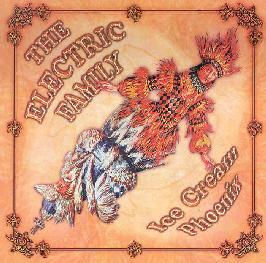 The Electric Family - "Ice Cream Phoenix"
From the opening spacey strums of Solid Structure, with their slight twang, some rich reverb-drenched harmonica, and icy, gothic piano notes, Ice Cream Phoenix is an album that drips with that classic acid 60’s Marin County Sound. Not surprising, considering the band borrowed the title, from an old Jefferson Airplane song. But this German collective (which includes nearly 20 members playing on this album!) puts its own unique spin on everything, stirring their creative juices to come up with something that’s fresh and exhilarating. Imagine David Crosby’s classic San Francisco super session If I Could Only Remember My Name filtered through Krautrock experimentalism, inject a heavy dose of Pink Floyd, and add to that Tom "the Perc" Redecker’s vocals, which sound like a mutant cross between Leonard Cohen and Wall of Voodoo’s Stan Ridgeway. Swirl it all together and you might start to get an idea of what Ice Cream Phoenix is all about. There’s plenty to like here. Soft washes of synth, strumming acoustic guitars, and lovely Gilmour-esque electric guitar shine through on Last Phase of the Moon. The Krautrock influence can particularly be heard on the terrific and moody Landmark Visions. Starting with chittering night sounds and a sudden crash of thunder, this one leads into a dazzling jam of pulsing electronics, congas, and radiantly mellow electric guitar playing. And check out the track Air Child, with it’s mournful slide guitar weeping and sighing its gorgeous melody. Wisdom of Wolves, on the other hand, is a jaunty acoustic rocker with quirky harmony vocals. The all too brief Axe Child - The End, features more beautiful, sleepy slide guitar, strumming acoustic guitar, and spacey electronics. It could have only been more perfect if it was a little longer! The band throw in a couple of interesting covers too, a mutant version of Crazy Horse’s Dancin’ Lady that sounds like Hawkwind playing cowpunk, and a particularly spacey yet energetic take on Floyd’s Careful With That Axe Eugene that even adds a bit of unique Marin County twang to it in the guitar work and some exotic textures with didgeridoo and tambura (the liner notes refer to Antonioni’s Zabriske Point, which I guess might technically make this a cover of Come In Number 51, Your Time Is Up). And the production is absolutely top notch, allowing each instrument its own clear voice, but letting just enough rawness into the mix so that it never once sounds over-produced. This album has the power to take the listener to the corner of Haight and Ashbury streets, if that intersection happened to lead one way to downtown London and the other to Munich, where voices and sounds blended everyday in new and wonderful ways. For more information you can visit the Hypertension web site at: http://www.hypertension-music.de.